Experience Nxabega Okavango Tented Camp in an area of forest woodlands and floodplains, just to the west of Chief’s Island. Combining the best of both worlds, the camp offers game drives and mokoro cruises or boating activities. Blending skilfully with the environment, nine exclusive tented suites set on raised wooden platforms are tucked beneath a canopy of ebony trees. Burnished teak floors and a steeply pitched thatch roof frame a lofty and comfortable living area. A maze of sparkling lagoons, meandering channels and overgrown islands teeming with wildlife, Botswana’s Okavango Delta lies like a sparkling jewel at the heart of the Kalahari Desert. Known as the river that never finds the sea, the Delta’s crystal-clear channels spread over the thirstlands of the Kalahari with their papyrus-fringed banks and fertile floating islands. Adapted for a life in and out of water, the elegant red lechwe and shy sitatunga are found in this watery wilderness. Lion, cheetah, leopard and African wild dog share the floodplains with large herds of elephant and buffalo. Hippo inhabit the deeper channels and lagoons, while honeybadgers can be seen in broad daylight. Tall termite mounds are homes for families of dwarf and banded mongoose. Traditional mokoro (dugout canoe) rides explore the delicate details of the glistening waterways, where iridescent dragonflies, frogs of every colour and jewel-like kingfishers live in the papyrus-lined banks. 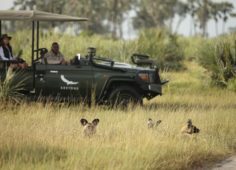 andBeyond Nxabega Okavango Tented Camp is located in a 25 00 hectare (61 775 acre) exclusive wildlife concession on the edge of the Okavango Delta, bordering the Moremi Game Reserve. Ideally positioned to explore the magnificence of the Okavango, the camp is known for its elegant tented accommodation, which boasts breath-taking views of the ever-changing Delta. Blending skilfully with the environment, nine exclusive tented suites set on raised wooden platforms are tucked beneath a canopy of ebony trees. Each spacious tent features ensuite bathrooms and private verandas with romantic salas overlooking the reeded floodplain. The heart of Nxabega lies in its handsome living and dining areas, where burnished teak floors and a steeply pitched thatch roof frame a lofty and comfortable space. Made from local timber, reed and thatch, the guest areas include indoor and outdoor dining areas, a Safari Shop and a swimming pool with an expansive viewing deck. From this springboard of comfort, guests are able to appreciate the exquisite beauty of the Okavango Delta. Private bush dinners, breakfasts in bed, lamplit cocktails on a river island or a walking safari with al fresco picnic are all provided with pleasure by Nxabega’s warm and friendly staff. Located in an exclusive 7 000 hectare (17 300 acre) wildlife concession, the nine ensuite safari tents of andBeyond Nxabega Okvango Tented Camp look out over the expansive lagoons and channels of the Okavango Delta. Cradled under a canopy of African ebony trees, each tent sits on a raised wooden platform and boasts sweeping views. Burnished teak floors and a lofty roof frame the sitting and dining areas. Private bush dinners, breakfasts in bed, lamplit cocktails on a river island or a walking safari with al fresco picnic are provided with pleasure by Nxabega’s warm and friendly staff. Nxabega Okavango Tented Camp was formerly known as Nxabega Safari Camp. Located in a private concession within the world-famous Okavango Delta, this camp is situated in an area of forest woodlands and floodplains, just to the west of Chief's Island. Combining the best of both worlds, guests have the benefit of both game drives and mokoro and boating activities. In this remote region, game viewing takes place in lush grasslands and in the intricate waterways of the Okavango Delta, while the rugged style Botswana accommodation of luxury canvas tents merges with elegance similar to an exclusive club. 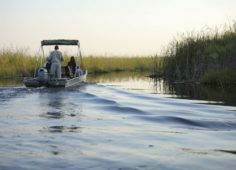 Nxabega means “Place of the Giraffe”, and is idyllic in its position to explore the magnificent channels and safari adventures within the game-rich Okavango Delta. You may come across aquatic antelope uniquely adapted to their surroundings, grazing lechwe, or birders might be lucky enough to spot the Pel’s fishing owl that swoops across the Delta at night. Raised on wooden platforms, this safari chic Botswana accommodation offers only 9 spacious tents – all built under massive ebony trees to let in the sights and sound of the African bush. Cowhide rugs and warm tones lend an air of relaxation. Each has a private en-suite bathroom with large shower to refresh you after a day on safari, followed by a relaxing sundowner on your private deck, overlooking the water’s edge. Enjoy a tranquil excursion by mokoro or trail through the reeds in a canoe, coming up close and personal to frogs, kingfishers and amazing plant life. Don’t forget the Big 5 and the very shy tree climbing leopard. Guest areas are cosy to while away the afternoon heat... take refuge in the shade of the thatch while enjoying the majesty of your surroundings. Adventure, Birding, Flora, Leisure, Nature, Relaxation, Star Gazing, Wildlife, And more.